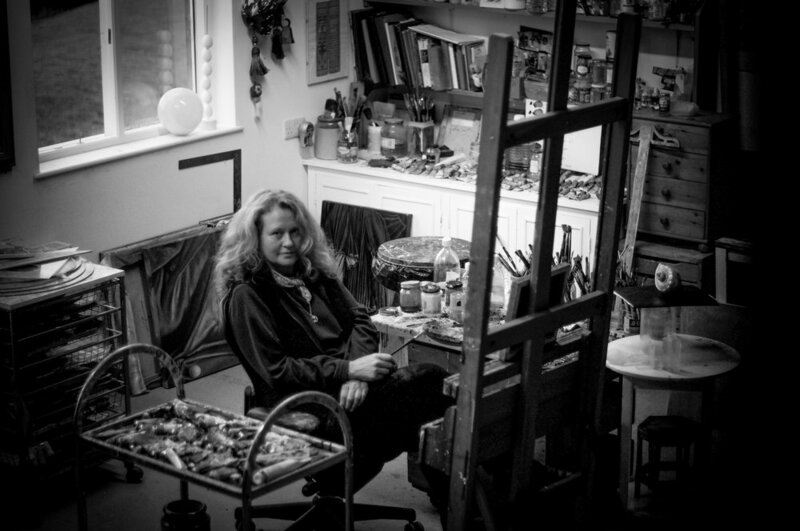 Julia Condon is an artist whose still lives and portraits have been collected and exhibited around the world for the last 25 years. Julia spent her early childhood in India, surrounded by color and decorative art, and she was educated in England. She attended Chelsea and Central School of Art (now Central St. Martin’s) where she received her BA in Fine Arts, after which she moved to New York. Working as an artist’s assistant and making money as a young portraitist, Julia honed her experience with technique and slowly accumulated a large body of work consisting of still lives and portraits. The inspiration for Julia’s early work came primarily from Renaissance painters such as Titian and Da Vinci. Her careful studies of their techniques enabled her to recreate a long-neglected method of glazing which enable her oil paintings to retain pronounced depth of color and definition. There can be as many as eighty layers of glazes on a single painting, each requiring at a day to dry before the next. By 1985 her intense interest and study of metaphysics unexpectedly expanded her paintings into a more abstract but no less intensely felt format. Using subtle layers of color and form, she created a rich, sensate manifestation of her exploration and work with energy and light. Colours and shapes are woven and re-woven until they hold an idea such as fluidity or shadow. As was true of Tibetan mandalas, these paintings are a modern invitation for the viewer to open to different conscious states and realities. Simultaneously, the artist reached into three dimensional expression with large, web-like mobiles of blown glass and crystals. Their floating patterns are used to represent the shifting mirrors of creation, both within and beyond. The integrity of her painting process permits her work to translate very successfully into fine arts prints. After eighteen years in the US, Julia moved back to Europe and broadened her subject matter to include Mandalas, which are essentially geometric expressions of energy in color. Hugely popular, her Mandalas are held in high regard for their beauty as well as their healing properties. To make her work more accessible, Julia decided to translate some of it into prints. Julia has created a line of affordable, high quality art. A successful Kickstarter campaign enabled her to buy a state-of-the-art printer so that she can supervise quality of reproduction on each and every print made.